When there is a draught, everyone can feel it. The dry air can be a real problem and draughts let in cold air and allow the warmer air to escape. For most people, spending money on heating is a total waste when the draught just penetrates all aspects of the house. Some people lose a large percentage through their roof, walls and windows. These are the main culprits, but the front door can also be as dangerous. Draught-proofing your front door brings may benefits. For example, it can save you money off your monthly heating bill. More importantly, it will help you to be a lot more comfortable in your home, rather than freezing all the time! Draught Proofing Tip 1. Carry a candlestick to check draughts: When you are checking your front door, carry a candle or joss stick with you to see the flickering. You will be able to tell where the draught is if you focus on using a flame to get the best understanding of where things are happening on your front door. Draught Proofing Tip 2. Don’t block all of your ventilation sources: Having some ventilation is good, so filling every single little thing is not a good idea. To let fresh air circulate your home, you have to pick and choose what kind of ventilation (controlled air flow) gets changed and what will stay. Draught Proofing Tip 3. The keyhole and letterbox – These are the two biggest culprits you should focus on when it comes to the front door. You can fix the keyhole with an easy purpose-made cover that drops a metal disc to protect against the draught. The letterbox can use a flap to keep things shut. Draught Proofing Tip 4. 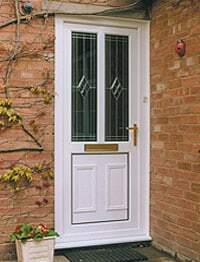 Edges and bottom of doors – If you are focused on the front door, then you need to be focused primarily on the edges and bottom of the doors. On old houses especially, it is easy for the foundation to shift and the space to widen between the ground or frame and the door. This gap creates the draught that can lead to some major problems. Draught Proofing Tip 5. Professional vs. DIY – Focus on getting your ego out of the situation and finding a professional if you think that you need the help. Advanced’s uPVC doors are draught proof by default. Call us on 08000 502 502.